Download this whitepaper to learn how you can achieve your business mobility goals and to learn how to prioritize and, ultimately, identify solutions to overcome challenges. Gaining IT control can be a difficult task, especially when your organization’s short and long term goals are not clearly defined. 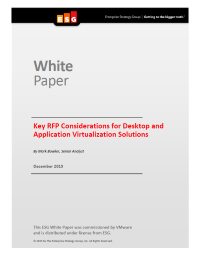 Creating an RFP that is in support of virtual desktop and application delivery serves as an important tool for use in your decision making process.